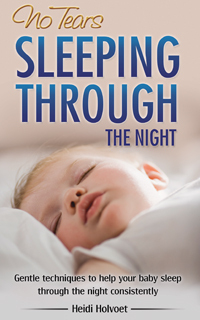 In this section you'll find the 3 steps you need to help your baby sleep through the night. If your little boy or girl is not sleeping appropriately long stretches at night, there's a lot we can do to help improve that, dramatically, at any age. Step 1. Get the basics right (details below): a solid sleep schedule, bedtime routine, pacifier use, etc. Step 2. Relieve physical & emotional discomforts (details below): due to teething, acid reflux, gas, separation anxiety, etc. Step 3. 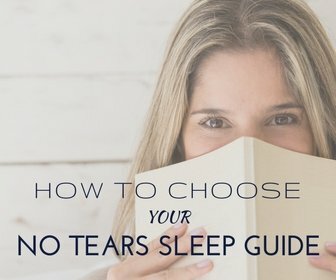 Use effective no-tears sleep techniques: weaning from nursing to sleep, self-soothing, staying asleep, overcome waking every hour, etc. For doable all-in-one action plans and support with this, you might find my ebooks Overcome Frequent Waking (if many wakings each night) and No Tears Sleeping Through the Night (if just 1 or 2 wakings a night) helpful. Good sleep is always based on the same solid basics and optimal sleep hygiene. A good sleep schedule helps your little one settle easily, sleep well and for longer stretches. A well adapted schedule helps newborn babies discover the difference between day and night (newborn schedule), several month olds to start taking regular naps and longer nights (schedule 1-4 months) and sees a bigger baby sleeping through the night consistently (schedule 4 - 12 months). Good naps during the day are crucial for good nights (see "Nap in a Snap" for step-by-step guidance for better naps). A bedtime routine is crucial to help your baby wind down before bed time and you'll also find your baby sleeping deeper and for longer stretches. Depending on your baby's age, night feeds may still be necessary. A newborn baby should not be without feeding longer than 3-4 hours. From anywhere between 4-6 months and 1 year old, night feeds will no longer be strictly necessary. Some will continue to wake for feeding out of habit, or for comfort and reassurance. Know that with the right techniques - in my approach these techniques are truly no-tears - you can help your baby sleep through for longer stretches up to all night, wean from being helped to sleep (feed, rock, hold, swing, ...), avoid early wakings and make the most of pacifier use (and how to transition away from it). Not everyone agrees on what "sleeping through the night" means: some moms are thrilled when their baby sleeps for 5 hours non-stop, others need 12 hours in a row before talking about "sleeping through". Find out what is reasonable to expect in "Isn't Your Baby Sleeping Through The Night Yet?". Trivial as it may seem, it's amazing how powerful a relaxed and positive attitude towards your baby's sleep is in helping your little boy or girl relax and sleep well too. Once you have all the above basics in place, your baby may still not be sleeping through the night. 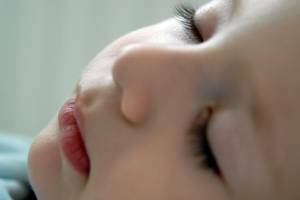 She may simply be too young to be able to, or one of the common sleep disturbances may be bothering her. 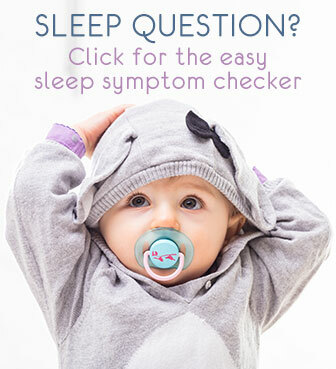 You can often easily avoid poor sleep due to a common cold, teething, a dirty diaper, separation anxiety, dreams, nightmares, night terrors, and more. Being able to self-soothe is an all important skill to have your baby sleep through the night. Most babies need quite some time and consistent guidance to learn to settle to sleep on their own. Luckily there are alternatives other than simply put your baby down awake and cold-turkey crying it out techniques: explore my effective self soothing tips through to different sleep method / sleep training approaches. If your baby is waking very frequently (every 45 minutes, every hour, every 2 hours, ...) don't miss my special article with a doable action plan for avoiding hourly awakenings, part 1 and part 2. If your baby only wakes once or twice a night, you might find "No-Tears Sleeping Through the Night" most helpful. It makes it doable to improve your nights, gently yet most effectively. What if my baby wakes every hour?